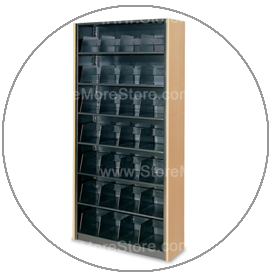 Looking for Datum Filing Dividers and Datum Steel Shelving Supports for use as Folder Separators? 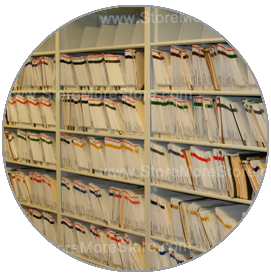 If you are looking for Datum filing dividers that you can easily slip into your file shelving, then look no further than StoreMoreStore! 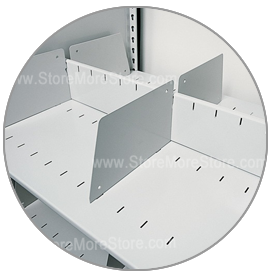 We are the premier provider of Datum filing dividers and steel shelving supports for use as folder separators on steel file shelves. We have Datum filing dividers available for letter-size, legal-size, and x-ray four post shelving. The Datum steel shelving supports are available in 18 different colors to match your existing Datum shelving. We have a simple process that will make it easier to make sure you to choose the right filing dividers and folder separators for your steel shelving. First, take an existing file divider and outline it on a piece of paper. Next, measure the file divider like the example below. 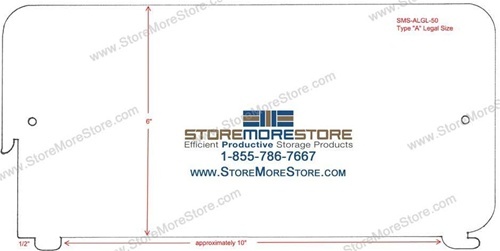 Then, all you have to do is compare your drawing to the measurements we have provided to find the right file folder separators for your steel shelving. If this is your first time to buy filing dividers or steel shelving supports for your shelving, don’t worry because we can still help you! 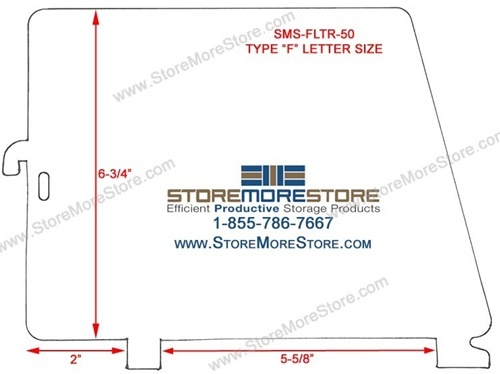 Just email us or give us a toll free call at 1-855-786-7667 and one of our representatives will work closely with you to find the right file dividers for your shelving. In addition to Datum filing dividers, we carry Spacesaver®, Mayline®, Aurora®, Borroughs, FEI, Richard Wilcox, and Tennsco. 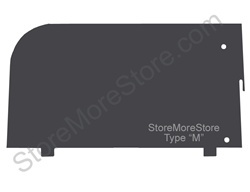 We even have a universal magnetic divider, so that no matter what brand of shelving you have, we have a filing divider that you will be able to use as folder separators! 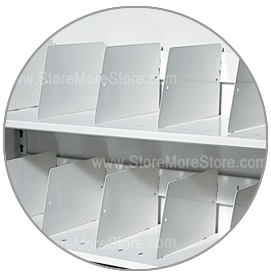 All Types of Steel Shelving File Dividers – Buy Metal File Dividers Online Shop Now! 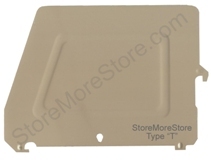 If you’ve just been handed a flat painted piece of steel and told, “we need some more of these things that clip into our shelves” and you don’t know where to go or what they are called, then come on over to StoreMoreStore because we can help you with all your metal file divider needs. 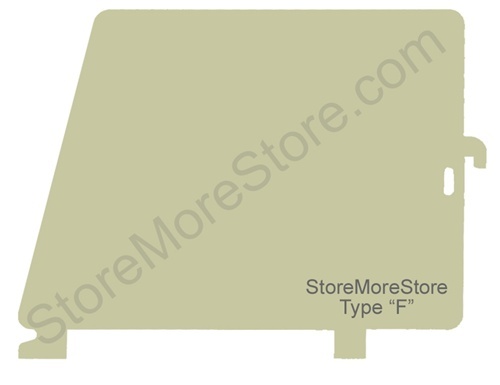 To start, the flat piece of steel you’ve just been handed is called a file divider; however, it is also known as a file support, file separator, shelving divider, or file shelf divider. 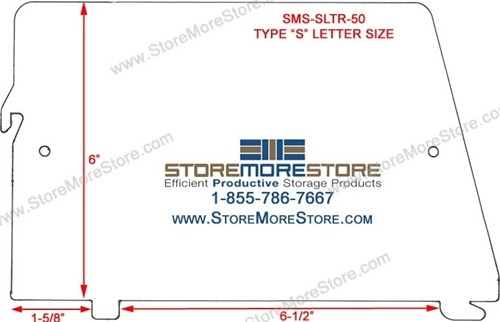 We have all brands of metal filing shelf dividers including Spacesaver® Corporation, Aurora®, Richards-Wilcox, Datum, FEI, Tennsco, Directline, TAB Products®, Southern Metals, Mayline®, Borroughs, and more, in letter or legal sizes. To help you determine which metal file divider is right for your steel shelving, we’ve dimensioned the most popular sizes so you can ensure you are purchasing the right file divider for your brand of shelving. 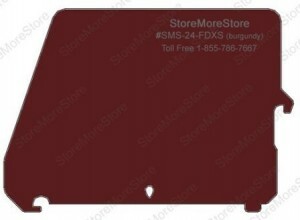 If you don’t see your particular file divider model displayed on the store, shoot us a note or call us toll free at 1-855-786-7667 and we can help you find the divider you are looking for. 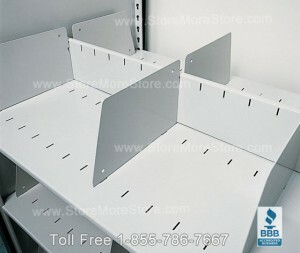 We’ve been doing this shelving gig for over 40 years, so we are experts when it comes to steel file shelving dividers. 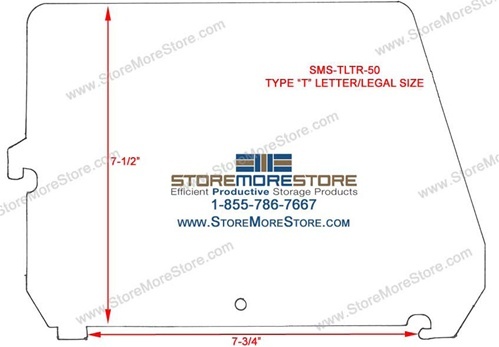 Visit our website, StoreMoreStore.com today or call us toll free at 1-855-786-7667 so we can help you get the right file dividers for your shelving and filing storage needs! 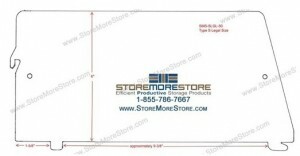 View the picture gallery below to review file divider dimensions and see how they can be used on your shelving. Are you using four-post open shelving to manage your files? That’s a great first step in improving records management. However, there’s always a next step in making your file system work even better. 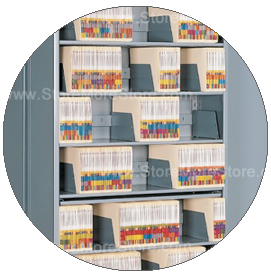 Adding steel shelving dividers is the logical progression for keeping your files grouped and standing upright within their appropriate categories. Being able to easily adjust the location of these file dividers keeps your files packed just snuggly enough for easy access. If they’re packed too close, it’s hard to get a folder out without accidentally pulling out more than one file. It’s also difficult to get folders back in their assigned place without damaging the corners and edges. Color coded filing systems rely on vertical support to keep the bars of colored labels in line. If file supports are too far apart in a color coded filing system, the folders slide down and rest at an angle. That’s the kind of “bad posture” that will leave your color-coded labels out of alignment, defeating the purpose of color coding files. 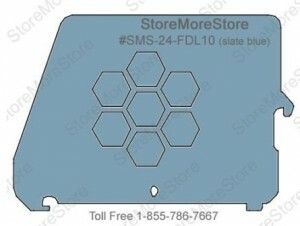 Need More File Shelving Dividers? There are a number of reasons you might want to acquire more shelving dividers. First, if you inherited your current shelving unit from a previous user or another office location, there’s a pretty good chance that the original metal dividers didn’t make it through the transition. They may have been packed separately and ended up lost. 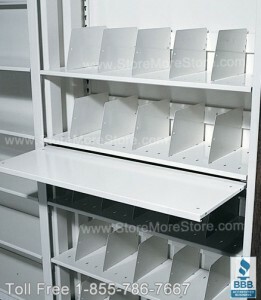 Or, maybe the number of dividers that came with your shelving system are inadequate for your needs. It’s kind of like when you go to a Tex-Mex restaurant and order fajitas for two people…and they bring you 3 tortillas to share. It’s just not enough to get the job done. 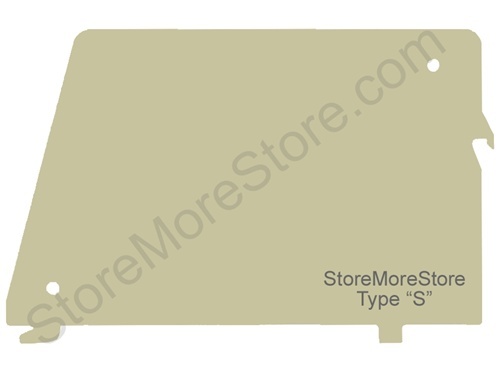 Fortunately, you can buy all different types of metal selving dividers from StoreMoreStore any time you need them. 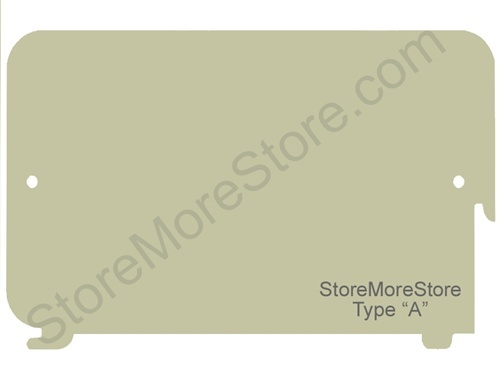 We’ve got sturdy steel file or shelf dividers from a variety of manufacturers. 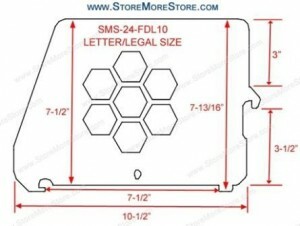 They are available in several standard colors in legal and letter sizes for single and double depth shelves. Our helpful customer service reps can help you figure out which model goes with your existing shelving system. 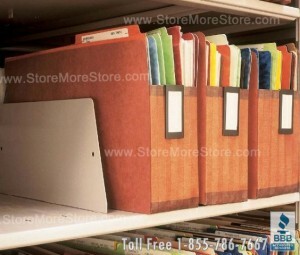 Even if you’ve got a non-standard filing system, we’ll do our best to help you track down the file dividers you need. 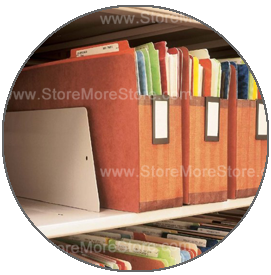 Shelving or file dividers or shelf separators help organize and manage your files for efficient file or document retrieval!